Canadian-based agribusiness company Feronia Inc is majority owned by the UK government’s CDC and other European and US development banks. Since 2012, development finance institutions (DFIs) have provided or committed nearly US$120 million to Feronia and its subsidiaries. DFIs claim to follow high standards for due diligence and are mandated to invest in private companies that contribute to the alleviation of poverty. 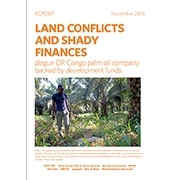 A report released today by African, European and international organisations provides further evidence to back the claims of local communities that Feronia is illegally occupying over 100,000 ha of land for its oil palm plantations and that wages for workers on the plantations remain below US$2 a day—an amount widely acknowledged to be insufficient to cover basic costs of living in the DRC. The report also shines the light on complex and opaque financial mechanisms that Feronia operated through its Cayman Islands holding company and that appear to have benefited Barnabé Kikaya Bin Karubi, the Chief Diplomatic Advisor to President Joseph Kabila and the DRC’s most recent Ambassador to the UK (2009-2014). The authors of the report are calling for public inquiries into Feronia Inc and the financial support provided by the CDC and other DFIs. They want Feronia and its DFI backers to immediately make public its land concession documents and the financial reports of all of its current and former subsidiaries. The authors of the report call on Feronia and its DFI owners to adhere to the longstanding demands of affected communities for the immediate return of their lands and for reparations. The full report is available in English, French ,Spanish, German , Swahili and Lingala. I am a soap maker and refuse to use palm oil just for this reason. I would appreciate all that can be done to restore the land and the communities. We need our rain forests.